Ashley decided that she wanted another chance to rock her wedding dress! And better yet, her husband, David, was all about being a part of it and her bridesmaids were there to help. There are always photos that you just might not get the chance to catch on your wedding day due to time and stress or weather and location, so having the opportunity to put your dress back on, pamper yourself with hair and makeup and set up a photo shoot that matches your wedding theme (or is completely different) can be an amazing experience and produce beautiful photos. 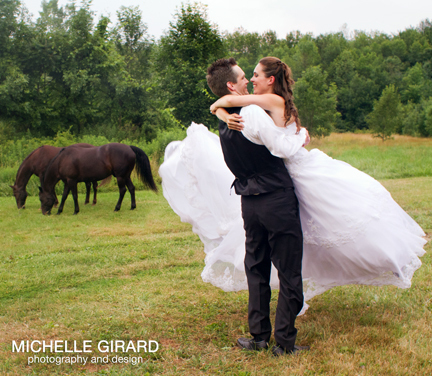 The photo shoot was at the beautiful Christine Vangee Equestrian Barn in Marion NY which has amazing property, including a beautiful little lake next to an apple orchard and photogenic walking trails. You should definitely check them out, they may even be available to host outdoor weddings! I am beyond excited about the images from the shoot. And couldn't wait to share one.